As George has noted, there are a variety of ways to stop your E20 prop. Ralph did look at alternative methods. The issue was prop run down time. The goal was to get the prop to stop quickly and reliably every time. The use of magnets in a bar rather than a strip of material that is attracted to a magnet provided a more positive prop brake. When the motor is shut off the prop stops almost immediately regardless of the slip stream strength. As Paul pointed out I went with the magnetic brake for it's ability to stop the prop quickly during my experiments with his 3D printed folding prop. The folder operated reliably with the magnetic brake and I used it at the 2017 US Nationals. Late last year I tried the 65 mm RJX or King Kong prop and retained the magnetic brake. I got a little better climb on the RJX and found the glide to be as good as the folder. That is what I used at the US National this year. I use a home made prop adapter on my models. I start with a commercial brass threaded push rod end that is then drilled out to fit the 1MM motor shaft. The brass comes with a 1/32" through hole from the package. I machine an aluminum back plate for the prop that gets bonded to the brass with red Loctite. After cutting the adapter to it's final length I machine a small aluminum spinner to retain the prop and magnet bar. Adjusting the stopped position of the prop is very easy with this arrangement. The prop hub is drilled out to slip on to the prop adapter and the hub is also machined flat on the front and back sides. 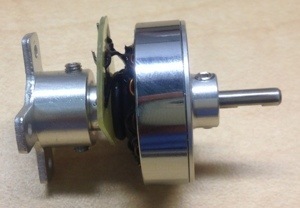 The prop adapter is bonded to the motor shaft with red Loctite. The attached photos probably make more sense than my description. The motor mount in the photos was cut from an old Horizon 4-Site gearbox. It has since been replaced with a 3D printed part but the function is exactly the same. The magnet in the motor mount is 1/8" X 1/16". The magnets on the prop bar are 1/16" X 1/16". I know what you are thinking and yes this does add a few tenths of a gram of weight but it's on the nose and can be offset with the battery placement. Two of my three E20 models needed some ballast to reach the 30 gram minimum weight so the extra weight of the prop adapter and magnets were not an issue. The model I flew at the last two Nats weighed 31.4 grams. I have not had an opportunity to fully trim out the lighter models yet. Thanks Ralph, I enjoyed the explanation. Interesting stuff about the magnet prop stopper, the pre-determined stop position sounds useful. Well the 2018 flying season in the Northwest ended last weekend. We had three contest E-20 was flown at each meet. Had a told of 9 different fliers and I ended up with the highest total time. Was able to get three maxes at each meet and won one fly off. At this last meet I was the only max out, many had 2 maxes but came up short on there third flight. As with most Free Flight it came down to picking the right time to fly. All the E-20's had good climbs,most are built up balsa and tissue but we have had a few all foam models. One was what I'll call a ultra high thrust with the motor about 1 1/2'' above the wing, it was very impressive. We all had fun and now look forward to next year. Congratulations on your E20 contest results. Please provide contact information or further details on the "all foam" and "ultra high thrust" line E20 designs. Well, I'm starting to make some progress on Mini-E #2. Ya, I'm a slow builder. Thought I'd post some pics of the build. Your new Mini-E is looking good. I look forward to seeing the finished model. Attached is a pic of the horizontal stab. If I keep going at this rate, I should be able to "maiden" by the end of the year. You look like you know what you are doing. Nice job, I love flying mine must have a couple hundred flights on it. Thanks, Bruce. I know I sure enjoyed flying mine during the short time I had it. Hopefully I will still have this one for next years Nats. Tachometer sensor test set up for a planned E-20 power train analyzer. the best motors and batteries on hand before each E-20 contest. 16,300 using a freshly charged battery with a stock motor and prop. Well, the weather being uncooperative(for flying), I've made headway towards finishing my Mini-E. This is a shot of the vertical stab being glued on. Here's some shots of the covered wings and fuse. The wing was covered with Litespan, the horizontal stab with domestic tissue and the fuse with polyspan. Everything has been sprayed with a coat of 30/70 Eze-Dope/water. Tomorrow, I'll give her 2 more coats and call it done. Right now, it's "toddy-time". Happy New Year everyone! Two nice models there guys! Skyrocket, is this your own design? Flytyer, I'm interested in the motor mount - is that alloy tube in the middle? If so can you tell me what size it is please? I've been working on some fully adjustable motor mounts for E20, possibly looking at 3D printing something. It's one of the most awkward aspects of design in my opinion, ie how to get a solid but fully adjustable mount. I've been building wings for some lighter models. Photo below shows a CLG style wing at about 9 grams and a 7% thick flat bottomed built up wing, 4 grams uncovered. The airfoil is modified from an Eggleston catapult section and looks decent in XFLR5. I'm using a fairly high dihedral and less of a pylon. I've also been doing quite a bit of motor thrust testing on small brushed and brushless set ups for our PMFC Open class. That's some nice looking work you're doing as well. Yes, the "motor sleeve" is an aluminum tube, 3/8" O.D. x .014W. It's a slightly loose fit on the O.D. of the motor which I will shim to a tight fit with cellophane tape. The nose block of course, is the usual laminated block fitted into the fuse in the typical rubber model fashion. This lends itself to shimming for thrust adjustment. My previous model of the same design, required very little thrust change. Very nice looking plane. Is this a published design or something of your own? I would certainly be interested in building one myself if plans are available. It looks to have a tapered, rolled fuse. If so, what did you use for a mandrel? Yes, the "motor sleeve" is an aluminum tube, 3/8" O.D. x .014W. It's a slightly loose fit on the O.D. of the motor which I will shim to a tight fit with cellophane tape. The nose block of course, is the usual laminated block fitted into the fuse in the typical rubber model fashion. This lends itself to shimming for thrust adjustment. I used the same noseblock method on my lightweight E20 but with the motor CA'ed straight in to the balsa. Works fine but making the motor removable would be nice. I would be happy to mail you a couple of tubes if you could PM me your address. Do you think it would cause a ruckuss at the post office if I put them in a 1" PVC pipe? to simplify construction, much like a HLG glider. John, that's a very generous offer, thank you. Let me just have a dig around and be sure I can't get it locally before I put you to any trouble and I will get back to you. Thank you very much! The motor mount - using a brushless 'pole' mount is and idea I also had but have yet to try. The common 24g 'blue wonder' motors have an 8mm diameter mount which could be drilled or filed out slightly. This is a prototype 3D printed motor mount I designed and had printed at Shapeways. The black plastic is stronger than the white and the printing was much more accurate (I only show the white one because it's easier to see in photos). The bolts are 1-72 nylon. The motor is glued into the front flange, and the "firewall" fits a 4mm carbon rod fuselage. The wires run through the large offset hole in the firewall. There is a recess, not visible in the photos, sufficient for the wires to pass from the motor out that hole. It could also be adapted to a built up fuselage and the wires routed through the center hole instead. There are some subtle changes that I want to make to the design that should get the weight closer to 1 gram. The material is more than strong enough, the limitation is the capability of the printer. For comparison, the aluminum mounts I've made were all about 1.5 grams. BTW the folding prop is made from an old Harbor Freight electric model and some Delrin. The diameter is 3.25" so it's not legal, just a proof of concept.